Home » Frequently Asked Questions » How Can I be Sure I can Trust my Lawyer? How Can I be Sure I can Trust my Lawyer? Several times a year I get calls from potential clients who are already represented but who want to fire their lawyer because “I think my lawyer is in cahoots with the insurance company.” As discussed elsewhere on this site, I always encourage represented claimants to go back to their current lawyer – often the problem relates simply to poor communication – perhaps the current lawyer has been unusually busy or perhaps his paralegal has is trying to protect the lawyer’s time. I find that workers’ compensation cases require a lot of attorney time. While there are a few instances where I do not have to take action on a case because my client is getting weekly benefits and is recovering from surgery or other treatment, there are usually issues that pop up. For example, my client’s mileage checks may be late, or a pharmacy doesn’t have authority from the insurance company to fill a prescription. Every attorney has his or her own style. I think it is possible to be both aggressive as well as pleasant when dealing with opposing counsel or insurance adjusters. There are also times when pleasantries are not appropriate. Realize that workers’ compensation lawyers representing claimants and those representing employers often deal with one another on multiple cases, and meet each other at seminars or State Board functions. You should not be unduly concerned if your lawyer makes small talk with opposing counsel. 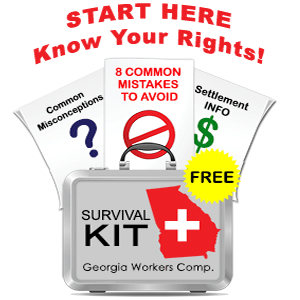 While I find that workers’ compensation practice in Georgia is extremely adversarial, my goal is to maximize my client’s recovery and to work towards the highest settlement and most favorable resolution that I can. I encourage my clients to talk to me if they have concerns about how I approach their case – you should feel comfortable doing so with me if I am your lawyer or with any lawyer you choose to represent you. I think it is very unlikely that a claimant’s lawyer would intentionally sell out his client or enter into inappropriate dealings with a lawyer or other representative of the opposing insurance companies. As professionals, lawyers are bound to uphold strict ethical and disciplinary rules. Lawyer are required to represent their clients zealously and are required to avoid any conflicts of interest. In other words, a lawyer could lose his license to practice law if he was to take any action adverse to the best interest of his client. If you are not happy with your lawyer it is possible to fire your lawyer and hire a new one. However, the first lawyer has the right to file a fee lien for work performed and you may have difficulty finding a new lawyer to take your case. The point – you should do your homework and learn as much as you can about legal representation when you first hire a lawyer.